This recipe is pieced together from many places: Various internet recipes, reading the ingredients on the ready-made stuff at the store, my own random additions. It has one solidifying piece though–everyone I make this for really likes it. It may seem complicated but it really is just that it’s a multi-step process. 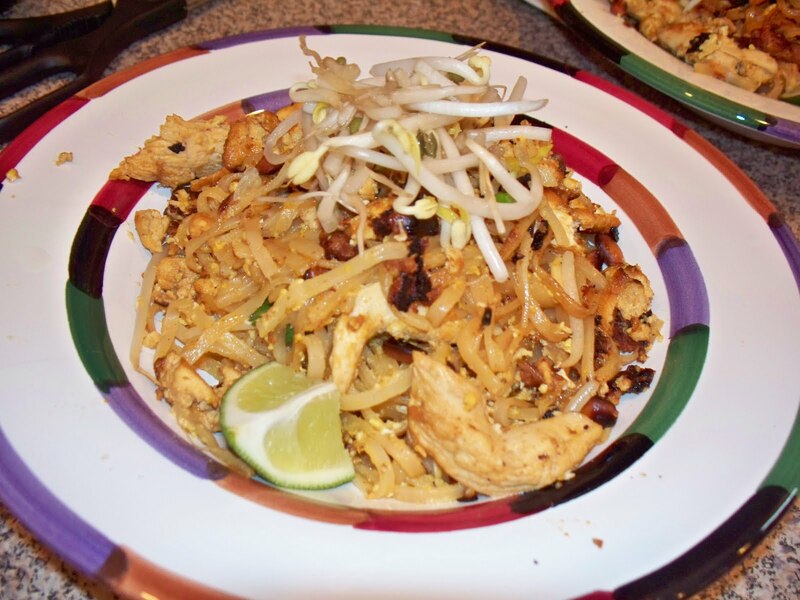 Making pad thai yourself will require a trip to the Asian specialty grocer as many of the ingredients can be more easily (and cheaply) sourced there. One thing to note, if you can only find tamarind in a large package at the Asian grocer you can buy a jar of the pre-made “Pad Thai Sauce” on the same aisle and jazz it up by adding more chili paste. I’ve included pictures from both of the weeks preparations. The first, a quiet dinner with family, the second, feeding many hungry mouths on girl’s night. Tamarind comes in either paste or pulp form, either of which will need to be soaked in hot water first. If you’re using tamarind paste, start with a spoonful mixed into 1/4 cup of hot water. If you are using pulp, for every one tablespoon of pulp use 1/3 cup boiling water. Mix all the ingredients together, stirring well until the sugar dissolves. If you need to add a little heat to do this you can make the sauce in a saucepan over low heat, stirring often. 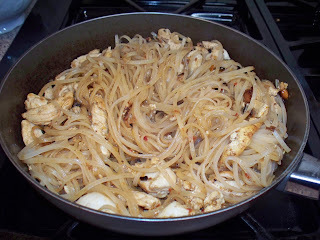 I recommend making the sauce while the noodles are soaking and the chicken is cooking and then setting the sauce aside for later. If you like you can make the sauce the day or morning before and stick it in the refrigerator until you’re ready for it. 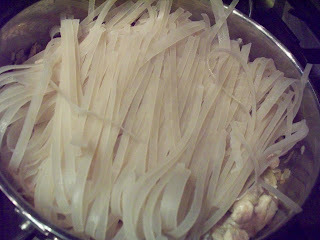 Soak the noodles in tepid tap-water for 10 minutes. Don’t let them get soggy! It’s better to under-soak the noodles and add some water to the pan later than to have ooey-gooey noodles. 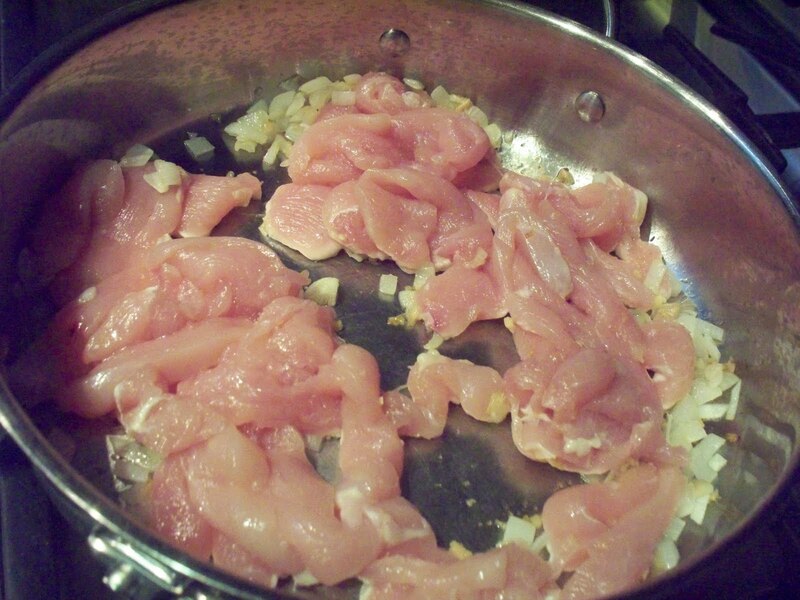 In a large skillet with deep sides, add enough oil to evenly coat the bottom of the pan and heat on high. Cook the garlic and shallots for a few minutes (I also like to toast a few peanuts with them). 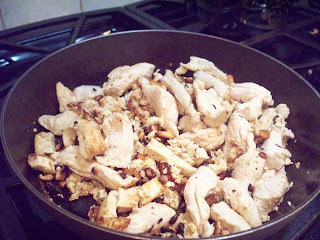 Add the tofu chunks and sear on each side until golden. Add the chicken pieces and cook until cooked all the way through, stirring regularly so nothing scorches. If things seem to be cooking too fast or to hot, reduce the heat to medium-high. Add the soaked noodles and toss into the mixture like a salad so you don’t break them. Add the sauce, pouring it evenly over the pan to minimize the need for stirring. In the center of the pan, make room for the egg. 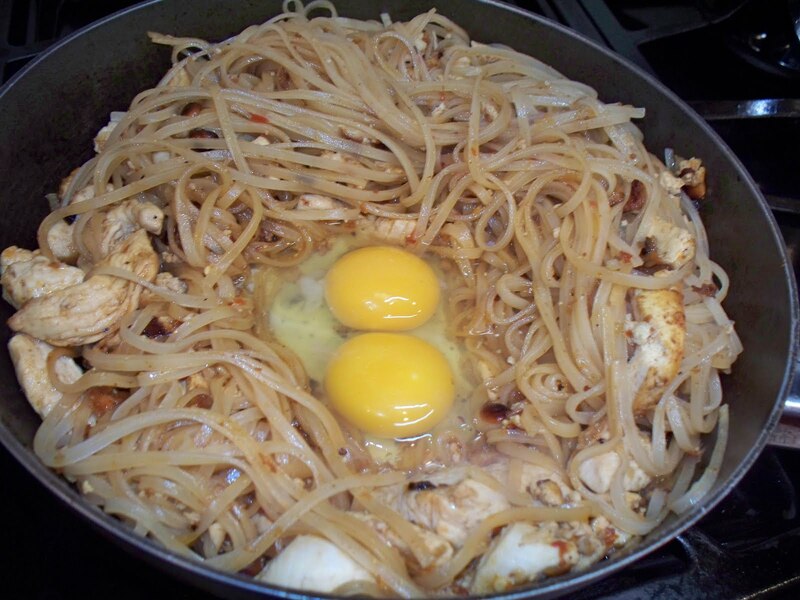 Crack the egg into the pan and scramble it before mixing it up into the rest of the meal. Add the shrimp and stir gently. (Shrimp will cook quickly from the heat of all the items in the pan so it need not make its way to the bottom of the pan). Add 1/2 of the bean sprouts, most of the peanuts (if you didn’t roast most of ’em from the start), and sliced green onions and stir to combine. Plate it up! Top with remaining sprouts, peanuts, cilantro, and limes. 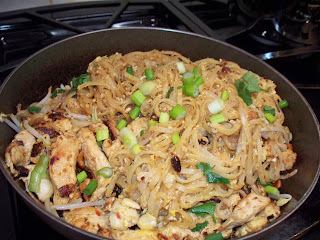 asian, chicken, gluten free, leah charney, noodles, younique eats. Bookmark the permalink. Post a comment or leave a trackback: Trackback URL.